There have been so many memorable cinematic summer camps, from Camp Crystal Lake of the FRIDAY THE 13th series to Camp Firewood of WET HOT AMERICAN SUMMER fame… But there’s never been anything like CAMP HALLOWEEKEND! 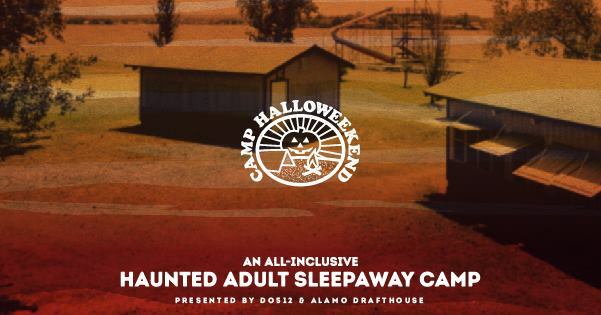 This Halloween, the Alamo Drafthouse Rolling Roadshow is teaming up with Do512, as well as Karbach Brewing Co. and Austin Eastciders, to throw the ultimate adult “summer” camp experience. Camp Halloweekend will blend classic camp games and activities with live music throughout the day, as well as show outdoor screenings of some of the greatest summer camp and wilderness horror movies all night long. This includes a special screening of the original WET HOT AMERICAN SUMMER featuring writer/director David Wain live in person, and a Halloween party featuring Brownout Presents Brown Sabbath! Each bunk sleeps 10 adults, and you can select your ticket by the bunk so that you have the option of choosing some or all of your bunkmates. Unlike some other adult summer camp experiences, we are not splitting campers up by gender, so if you would prefer an all-male or all-female bunk your best bet is to reserve all 10 bunks with your friends. Check out the full map of the campground and pick out your favorite bunk, then purchase tickets on this site for your favorite available bunk. Your ticket also includes your official Camp Halloweekend T-shirt, so make sure you give us your preferred T-shirt size during the check out process!